Tom Uglys Bridge crosses the Georges River between the suburbs of Blakehurst and Sylvania. The truss span which opened in 1929 is quite a contrast to the duplicated box girder span which opened in 1987 and can be seen here. When the original bridge was built, it was known as the Georges River Bridge, but was renamed to distinguish between the various bridges on the river following the opening of the Captain Cook Bridge in 1965 and the Alfords Point Bridge in 1973. 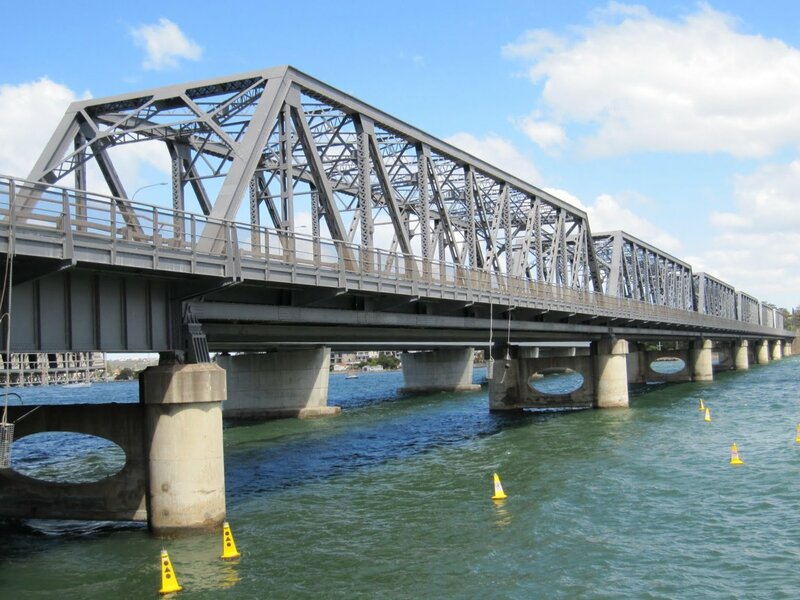 Tom Uglys Bridge took its name from the southernmost part of Blakehurst, known as Tom Uglys Point, which is believed to be named after local resident Tom Huxley and transformed by the mispronunciation by local Aborigines. That is a great Theme Day post! You're right, that is quite a contrast between those two bridge spans. But not an ugly bridge, e? Yes I've seen Toms Ugly bridge on other Sydney blogs and indeed it isn't ugly unlike the modern monstrosity. Wonderful photos as always and interesting info. Oh yes what a difference. Love that name, Tom Ugly's bridge. I know which bridge I prefer. I like the twin photos approach to the theme. Great post! Two exquisite portraits! But not an ugly bridge, I think . Ow, how you bring back memories from the days I traveled to sydney everyday from Kiama. I traveled over these bridges every work day. Your doing a great job J Bar, thanks for taking me back! Nice shots of the two (definitely not "twin") spans! I like the contrast of the shaddows beneath the bridge (right shot) as well. You could be right, Julie. There's a lot of different information out there. Some sources suggest he was a land owner here. You know, I was feeling quite sorry for Tom Ugly. I'm glad that you explained how the name came about.